As part of its course WSP 172: “Coffee: From Tree to Beans to Brew and Everything in Between,” Stanford Continuing Studies hosted and organized the Stanford Coffee Symposium, an educational and tasting event situated outside of Green Library, on Saturday morning. The event, which offered a continuation from the class’ content, aimed to help attendees learn more about coffee’s role in the economy, history, biology and brewing techniques and varieties. The coffee symposium was the result of 18 months of thought and planning, according to Greg Sherwin, one of the event’s co-organizers. Professor of Biology Virginia Walbot ’67 had previously invited Sherwin to create an event that Walbot had arranged at Stanford a few years prior. The coffee symposium included offering attendees samples of different kinds of professionally barista-brewed coffees and coffee beverages. Samples included freshly brewed coffees from Bay Area coffee houses such as Café Venetia, Blue Bottle Coffee and Barefoot Coffee Roasters. Coupa Café was also one of the vendors offering samples and tasting. 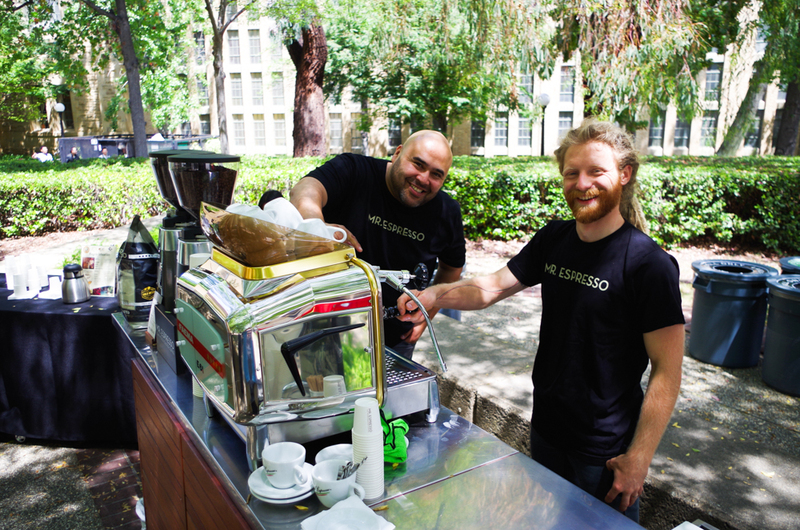 “In this event, we are here to showcase different coffee grounds and brewing methods,” said Julio Cesar, who works at Coupa Café and who represented the chain at the event. Sherwin explained that one of the goals of the event was to help educate attendees about the flavors and varieties of coffees, in addition to other issues related to biology and agriculture. “You can’t just talk about coffee and not have it – these guys are here to help us enjoy it as well,” Sherwin said, in reference to the representatives from coffee houses and their sample selections at the event. One of the other highlights of the event was a coffee tasting program run by Blue Bottle Coffee, a famous San Francisco coffee company. Stephen Vick, the coffee buyer at Blue Bottle Coffee, was one of the many representatives arranging the event. The tasting program was centered around a blind tasting of three different coffees and culminated in a talk on the properties of coffee and the nature and function of different brewing techniques. “The idea is to, at the end of the day, talk about the properties of the coffee,” Vick said. The event sold out, drawing a large crowd of Stanford community members, students and local residents. Sherwin attributed the popularity of the event to an increased interest in high-value coffee. Contact Nitish Kulkarni at nitishk2 ‘at’ stanford ‘dot’ edu.